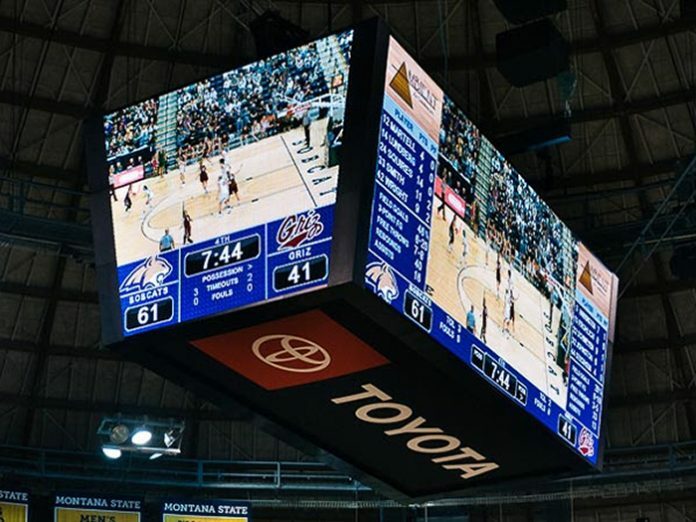 When Montana State University Bobcat fans returned to Brick Breeden Fieldhouse in Bozeman, Montana, they were greeted by a new LED video board configuration designed, manufactured and installed by Daktronics of Brookings, South Dakota. The installation took place this fall to bring new visual elements to Bobcats basketball games and other events. The two sideline-facing video boards each measure approximately 9.5 feet high by 23 wide and the end-facing video boards measure 9.5 feet high by 11.5 feet wide. All four displays feature six-millimetre line spacing to provide crisp, clear imagery with wide angle visibility to appeal to every seat in the arena.